Malicious cyber attacks are outpacing the rate that organizations can effectively defend themselves. Multi-vector DDoS attacks and advanced persistent threats, such as malware and ransomware, are becoming more frequent and more complex. Leading DDoS mitigation providers are reporting that 34 percent of DDoS attacks include at least three different types of attack vectors and more than 30 percent of DDoS attacks are now directed at cloud-based services. In fact, the latest A10 findings state that 77 percent of organizations expect multi-vector DDoS attacks to pose the most danger in the future. That A10 report also outlined the scale and scope of DDoS attacks in the last year. On average, an organization was aware of 15 DDoS attacks against their public-facing domains and assets. Alarmingly, 32 percent of these organizations faced more than 25 attacks in the last 12 months alone. All told, the most common peak bandwidths (40 percent) of these attacks were in the 30-40 Gbps range. During legacy strategies, threat actors deployed volumetric attacks against a single layer (e.g., network and applications layers). 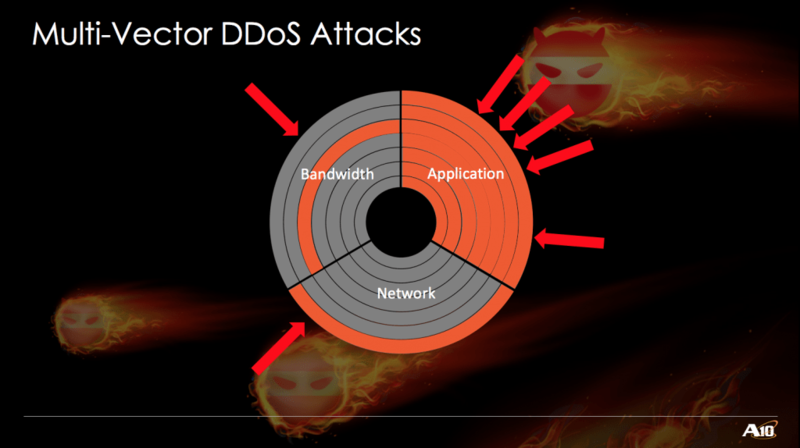 As DDoS security controls evolved, attackers honed their techniques to target all layers simultaneously, providing a greater chance of success against their target. Volumetric Attack — A common DDoS strategy, volumetric attacks flood the network layers with a substantial amount of (generally) legitimate traffic to consume as much bandwidth as possible. In typical scenarios, volumetric attacks are part of a botnet so traffic does not come from a single source. Protocol Attack — Also known as a “state-exhaustion” attack, protocol attacks target the connection tables in firewalls, servers, load balancers and other network devices. Application-Layer Attack — Targets Web servers and applications running on servers. As early as 2014, attackers were using as many as five vectors and 100 gigabytes per second of throughput to topple organizations. A well-orchestrated, multi-vector attack will have little trouble taking down the online presence of an unprepared organization. The cost? More than $1 million per hour, according to Ponemon. On the Cisco Live 2016 expo floor, expect to see the most advanced DDoS mitigation solutions yet. Visit A10 at Booth 1944 to learn more about the latest multi-vectors DDoS attacks and your options for defeating them without hindering performance or risking your business.